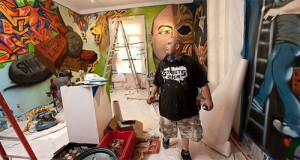 Leon Rainbow is definitely one of the most prolific artists in the central Jersey fine art and graffiti scenes. His work is widespread – from street art to murals to commercial pieces, you gotta admire Leon for his hustle as much as his art. His art is great too – fresh, original, ambitious, and infused with that strange sense of humor that Rainbow always brings around. This exhibit will be a retrospective of his works from 1999-2013, a rare chance to see a large collection of his work in one place. Work will remain on display until June 8th 2013.